Paul the Apostle makes the statement, "we are not like Moses." Most of us would quickly agree. Moses was the most humble man on earth. 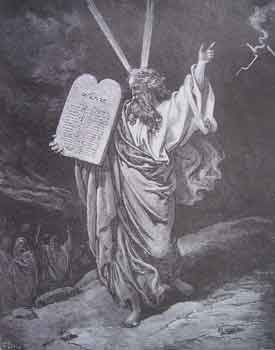 Moses came down the mountain with the Ten Commandments from God! Moses spoke to God as a man speaks with his friend. We're certainly nothing like Moses! That’s not what Paul means. Paul is making a comparison between the Old Covenant and the New. If the Old Covenant was glorious, how much more will the New Covenant be? That which was fading away was glorious, so that which lasts, the eternal New Covenant, is that much more glorious. Having this hope is what gives us boldness. No, we're not like Moses. Moses would go up the mountain of the Lord, speak with God and receive the Word of God. When he came down his face was glowing with the glory of God . The people would be freaked out by the supernatural glow on his face. So Moses would take a veil and cover his face to hide the brightness of that glory! That reflection of God's glory would fade from Moses' face over time! That glory didn’t last. The longer Moses was away from the LORD, the less his face would radiate with the glory of the LORD. If you've ever had any kind of glow in the dark material, you'll know what I mean. But we, with unveiled faces, constantly reflect the Lord’s bright glory, and that glory isn’t fading away! The glory of the Lord that our countenance reflects - those of us who have turned to the Lord and have had the veil taken away, the glory we reflect isn’t fading. That’s why Paul said we’re not like Moses! The glory on his face faded over time. The glory that we reflect - because through Jesus, we always have access to the Presence of the LORD, the glory we reflect is growing more and more glorious; Ever-increasing glory; We're going from glory to glory! We’re not like Moses! The glory on Moses decreased, the glory we reflect his increasing! * We are made competent - that means able to do something, and do it well! * Competence leads to confidence! * Confidence is expressed as boldness! * Since the glory is ever-increasing, so is the competence and boldness!